Our attention has been drawn to this post which features a Grace College volleyball player (currently in the Middle East) and her NFL player brother. Kaitlin Kerrigan is with the Grace College volleyball team on a two-week tour of Isreal. Her brother, Ryan, plays for the Washington Redskins. A portion of the story appears below. Click here for the complete article and both photos. When you actually stop and think about how digital communication works (for example: posting pictures to Instagram and Facebook), it’s pretty revelatory and overwhelming, primarily if you have no clue how WiFi allows you access to the internet. Consider the fact that a photo shoot at Redskins Park could connect a brother and sister 5,913 miles apart today. Then consider the fact that a specific pose was replicated in that same distance. Well, they happened folks. And while this stuff happens all the time between families, why not just appreciate the ability to do such a thing in this specific moment? The pose belonged to linebacker Ryan Kerrigan, who knelt down to his right knee and flexed as though he had just annihilated a quarterback and wanted to scream it to the whole world. The “Heartbreak Kid” even squeezed his eyes shut because the damage he committed was so brutal. Well, his sister, like Big Brother, is always watching. 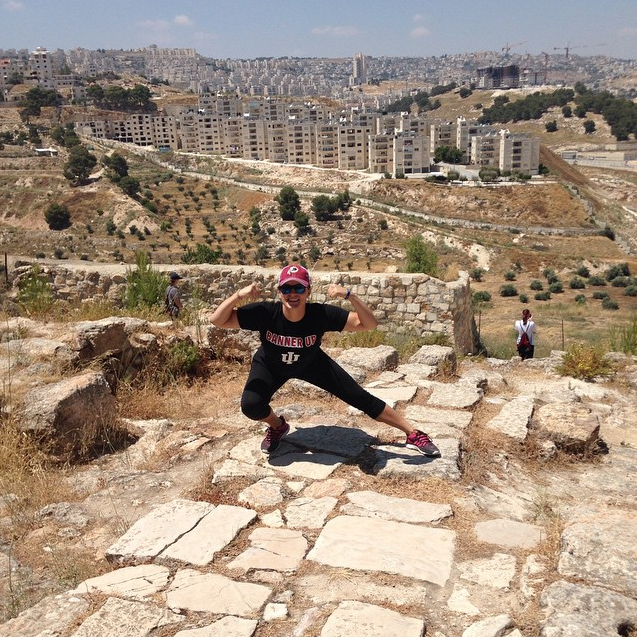 And so, abroad in Bethlehem, those many miles away, Kaitlin pulled her own “Heartbreak” move out, dressing in an Indiana Hoosiers shirt and a Redskins hat. Her sunglasses prevent us from knowing if her eyes were shut, but the lunge and flex are accounted for, her face providing less a yell than a smile. Click here for the complete article and both photos.